Are you looking for something interesting, informative and amusing to do as summer winds down? Do you want to learn new skills to impress friends and family? If so, the Budimir Branch of Windsor Public Library (1310 Grand Marais Road West) has just the event for you. 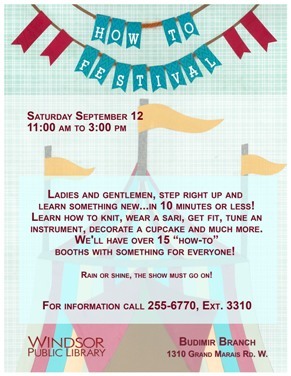 On Saturday, September 12, the Budimir HOW-TO FESTIVAL is scheduled from 11 am through 3 pm – rain or shine. Located around the grounds will be close to 20 HOW-TO booths – where members of the community can learn something new in 10 minutes. Learn how to knit, wear a sari, get fit, play an instrument, decorate a cupcake, perform a simple magic trick and much, much more. Windsor Public Library – how to download apps & digital content onto your mobile device. Materials on each of the topics will be available to check out as well in case you’d like to explore some of these skills in more detail! For more information, please contact Christine Rideout-Arkell at 519.255.6770, Extension 3310.